Does this patient have essential hypertension? Despite recent advances in the treatment of hypertension, and increased public awareness by the introduction of several public health campaigns such as National Blood Pressure Education Program, hypertension remains a prevalent medical condition affecting ~30% of United States (US) population aged 18 years and older with no significant change in the last 10 years. The prevalence of hypertension increases with age with the highest prevalence in individuals aged 60 years and older (67%). Hypertension exerts a strong and continuous relationship with the risk of developing cardiovascular disease (CVD). Elevations in both systolic blood pressure (SBP) and diastolic blood pressure (DBP) are associated with increased risk of heart attack, stroke, heart failure and chronic kidney disease (CKD). According to the 2008 National Health and Nutrition Examination Survey (NHANES) data, the prevalence of hypertension is almost equal in men and women. The Non-Hispanic African American (AA) race has the highest prevalence (43%) followed by Non-Hispanic Whites (28%) and Mexican American population (22%). The prevalence of hypertension is also adversely affected by the socioeconomic status, level of education, obesity and geographic location in the US, with the southern states having the highest prevalence. Overall, only 78% of patients with hypertension are aware of their diagnosis and only 68% of those who are aware get treated, of which only two-thirds have their blood pressure (BP) at goal (<140/90 mmHg). Although control of BP among those who were taking pharmacologic treatment is similar for men and women aged 18-59 years, it is higher in men aged 60 years and older. Older patients and AA are treated more commonly than the Mexican American population, but this does not always translate into better outcomes. What tests are routinely indicated in the initial evaluation of patients with hypertension? When should additional testing be considered? The decision to initiate pharmacologic therapy in the treatment of hypertension involves assessment of cardiovascular risk, recognition of evidence and extent of target organ damage and identification of coexisting medical conditions and secondary causes of hypertension. The basic evaluation for hypertension includes a thorough history and physical examination, basic chemistries that include measurement of glucose, creatinine, estimated glomerular filtration rate (GFR) and electrolytes (serum sodium, potassium and calcium) and fasting lipid profile. Additionally, urinalysis to detect hematuria and proteinuria (spot total protein/creatinine ratio if dipstick is positive) and electrocardiogram for identifying LVH is essential (Figure 1). 1. Urine albumin concentration or urine albumin/creatinine ratio: A urine albumin concentration >20-30 mg/L or urine albumin/creatinine ratio of 30-300 mg/g is suggestive of microalbuminuria and is the earliest sign of nephropathy in patients with diabetes. Screening for this is recommended at the time of diagnosis and yearly thereafter in diabetic patients who are being evaluated for hypertension. Screening in non-diabetics is not strictly recommended but is acceptable as microalbuminuria is an independent cardiovascular risk factor. a) In patients with white coat hypertension who have no clinical evidence to suggest target end organ damage and are low to moderate cardiovascular risk. b) Patients with isolated diastolic hypertension who otherwise have no major cardiovascular risk. c) In patients with a history or clinical evidence of structural heart disease in whom echocardiographic evaluation may guide the selection of antihypertensive therapy. d) EKG abnormalities such as AV nodal block may need further evaluation with echocardiogram. 3. Serum uric acid: Hyperuricemia has been implicated as a pathogenetic factor in the etiology of hypertension, though the benefit of treatment is unclear. 4. 24 hour ABPM:Required in selected patients with white coat hypertension who have no evidence of target end organ damage in whom treatment may otherwise be unnecessary. Lastly, further testing for evaluating secondary causes of hypertension is based on clinical suspicion and has been discussed elsewhere. How should patients with essential hypertension be managed? What are the correct methods/techniques of recording and interpreting blood pressure in clinical practice and why is it important? Several techniques exist for recording the arterial BP. The most commonly used technique involves measuring the BP in the arm using a sphygmomanometer at the physician’s office. Proper technique for recording the BP should incorporate all the steps outlined below. The patient should be calm and comfortably seated for at least 5 minutes before BP recording. Nicotine and caffeine should be avoided. Any clothing on the arm should be removed. The legs should be uncrossed and back and arm should be supported. The arm should be at the level of the heart with palm facing upward. Selecting appropriate cuff size is vital. The cuff size is considered appropriate if the width of the cuff is 40% and inflatable portion of the cuff occupies 80% of the arm circumference. Small cuff size falsely elevates BP readings and large cuff size falsely reports low BP readings. A rule of thumb is that patients with the arm circumference ≥ 11-12 inches need a larger cuff size. The cuff should be inflated by > 20mmHg following the disappearance of the radial pulse to obliterate the blood flow to the brachial artery. The cuff is next deflated until the tapping Korotkoff phase 1 sound is heard, which corresponds to the SBP. As the pressure in the cuff is allowed to fall further, the sounds change in quality, then become muted, and finally disappear altogether. This disappearance of the sound (Korotkoff phase V) represents the DBP. In older patients with wide pulse pressure, the Korotkoff sounds typically disappear between the phase I and V. This phenomenon is referred to as auscultatory gap and may be indicate of target organ damage (TOD). The predictive value of multiple BP readings is stronger than one single reading and the average of multiple BP readings should be used. It is also important that elevated BP be confirmed on 2-3 different occasions before a diagnosis of sustained hypertension is made. BP should be measured in both arms as the SBP may vary by 5-15mmHg between the arms in some hypertensive patients. Higher values than this may suggest coarctation of aorta, aortic dissection, or subclavian artery stenosis. The arm with the higher BP should be used for follow up. Are BP measurements obtained at sites other than the arm reliable? Measurement of BP over the radial artery in the wrist or over the popliteal artery in the leg is often associated with falsely elevated BP readings of ≥ 20mmHg. Wrist monitors may sometimes be used in obese patients and are acceptable provided the wrist is at the level of the heart. Finger monitors are not reliable. Central aortic systolic pressure is usually lower than the brachial artery systolic pressures and is likely a better determinant of cardiovascular risk, particularly stroke and heart disease. New non-invasive devices for measurement of central aortic systolic pressure are being introduced and have the potential to change how BP is measured at home and office. What is the role of 24 hour ambulatory blood pressure monitoring (ABPM) and home blood pressure monitoring (HBPM) in the management of patients with hypertension? a) Inaccuracies in the BP measurement technique, most of which are avoidable. b) Circadian variation of the BP exists in humans with BP being 10-20% lower around midnight to 3:00 AM (nocturnal dipping) and highest in the first few hours post awakening. Certain individuals have a blunted response to this nocturnal drop in BP and are termed “non-dippers.” These individuals have been identified as having higher cardiovascular risk, notably for stroke and heart failure. Office BP measurement limits recognition of these individuals. c) Masking and the White Coat Effect: Elevated BP (>140/90 mmHg) in the office setting but normal at other times is termed white coat hypertension and conversely, elevated BP at home but normal in the physician’s office is termed masked hypertension. Both of these conditions have an impact on the management strategy of patients with hypertension. Recognition of these limitations has led to more reliable techniques of measuring BP. These include the HBPM and 24 hour ABPM. Both these techniques provide out-of-office BP readings that are operator independent. Moreover they provide multiple BP readings that better predicts the hypertension related burden on the cardiovascular status of the patient over the long term. ABPM is a non-invasive, automated measurement of BP by the oscillometry technique at 15-30 minute intervals several times during a 24 hour period and provides a mean systolic and diastolic BP during the daytime, nighttime and 24 hour time period (Figure 2). HBPM involves the use of easily available, inexpensive oscillometric BP measuring devices. It offers the convenience of checking the BP in “natural circumstances” and provides actual burden of BP on the cardiovascular health of the patient. Several similarities and differences between these two techniques have been listed in Figure 3 (a and b). a) White coat hypertension: It is defined as patients with normal out-of-office blood pressure but elevated BP in office. b) Masked hypertension: defined as normal office BP but elevated out-of -office BP. Identification of patients with these subtypes, is vital, as recent studies have shown that patients with masked hypertension are at increased risk of cardiovascular disease almost similar to the magnitude seen in patients with sustained hypertension. On the contrary, identifying patients with white coat hypertension avoids unnecessary pharmacologic therapy which may be costly and potentially harmful. c) HBP Monitoring has a potential role in improving patient adherence in hypertension treatment. d) Treatment of patients with resistant hypertension. a) Patients with arrhythmias and atrial fibrillation. In conclusion, ambulatory methods of BP measurement are gaining popularity in clinical practice and have been validated in several observational studies to have an impact on cardiovascular mortality and morbidity. 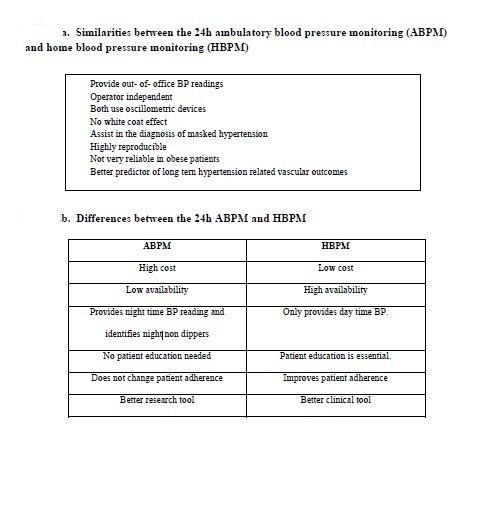 Although the benefits of both ABPM and HBP monitoring overlap, home measurement of BP besides being inexpensive and widely available, offers added advantages of improvement in patient adherence to medical treatment, avoids overtreatment and facilitates team approach particularly with telemonitoring and transmission of readings to the physician so that timely modifications of treatment can be made. How is pre-hypertension defined and how should we treat it? The term “pre-hypertension” was first reported in the Seventh Report of the Joint National Committee (JNC7) on the Prevention, Detection, Evaluation and Treatment of High Blood Pressure to describe individuals whose SBP falls between 120-130 mmHg and/or DBP between 80-89 mmHg. Based on this definition, about one third of the adult US population has pre-hypertension. The concept of pre-hypertension assumes significance as there is a linear increase in SBP with advancing age that confers a residual risk of developing hypertension with the passage of time. A recent Framingham study demonstrated that a normotensive 55 year old has a 90% chance of developing hypertension during their lifetime. The purpose of introducing the term pre-hypertension was to identify, alert and monitor individuals who are at a higher risk of cardiovascular, cerebrovascular and renal events, as observed in large epidemiologic studies. However, not all hypertension specialists agree with this terminology. Abdominal obesity is considered a major risk factor for this condition. The hyperdynamic circulation in obese individuals coupled with increased peripheral resistance due to endothelial stress, and exaggerated neurohumoral and renin-angiotensin activity (RAAS) leads to gradual elevation of BP. Some of the evidence linking exaggerated neurohumoral and RAAS activity in this subset of individuals was noted in the “TRial Of Preventing HYpertension (TROPHY) study where inhibition of the RAAS axis by candesartan led to 10/4 mmHg reduction in BP that persisted for the 2 year study period. However, this reduction in BP slowly disappeared following cessation of the candesartan therapy. How should patients with pre-hypertension be managed? Non-pharmacological measures are the cornerstone of treatment in the management of individuals with pre-hypertension. Weight loss is the preferred therapy for obese individuals, who constitute the major proportion of individuals with pre-hypertension. Improvement in BP shares a linear relationship with the amount of weight loss. Other lifestyle modifications include higher levels of physical activity, DASH-style diet with low sodium content (2.3g/d), moderation in alcohol use and avoidance of tobacco products. The utility of pharmacologic therapy in patients with pre-hypertension has not been well established. Although the TROPHY study demonstrated a 66% reduction in the prevalence of hypertension in patients on candesartan therapy at 2 years, and the Randomized Olmesartan And Diabetes MicroAlbuminuria Prevention (ROADMAP) study found that the early initiation of angiotensin receptor blocker (ARB) therapy in diabetic individuals with pre-hypertension reduced incident microalbuminuria, the long term outcomes studies in terms of cardiovascular and renal benefits are lacking due to the fact that these trials would be large, long, and expensive; and therefore difficult to perform. However, pre-hypertension patients with coexisting medical conditions that elevate cardiovascular and renal risk such as metabolic syndrome, mild CKD, and insulin resistance may benefit from pharmacologic therapy particularly with RAAS blockers, including ARB or angiotensin converting enzyme inhibitors (ACEI). What is the goal blood pressure in the management of patients with hypertension and how low should we go? In the last three to four decades, several clinical trials have proven the benefits of hypertension treatment in lowering the risk of stroke by 35-40%, myocardial infarction by 20-25%, heart failure by >50% and left ventricular hypertrophy by 35%. The blood pressure goals for systolic and diastolic hypertension vary based on the age. The Eighth Joint National Committee (JNC8) which utilized only evidence-based trial results from randomized controlled trials recommends a BP goal of <140/90 mmHg in the adult hypertensive population < 60 years of age with or without cardiovascular disease, diabetes mellitus, and CKD (± proteinuria). While a SBP goal of <140 mmHg in patients with diabetes, cardiovascular disease, and non-proteinuric CKD is supported by large epidemiological studies and endorsed by several scientific societies such as American Heart Association (AHA), Kidney disease – Improving Global Outcomes (KDIGO) and American Diabetes Association (ADA), SBP guidelines for CKD patients with albuminuria or proteinuria vary among different societies. KDIGO 2012 suggests: lowering SBP <130 mmHg in these patients but this recommendation is not supported by JNC8 guidelines. Thus, the lack of data would default the goals to known treated levels with proven morbidity and mortality benefit. Although a goal DBP of <90 mmHg is obtainable in >90% of general hypertensive patients in several studies, and is associated with cardiovascular risk reduction benefits, the DBP goal in patients with cardiovascular disease, diabetes mellitus, and proteinuric CKD patients is controversial. Although American Diabetes Association and several other scientific societies have recommended a DBP goal of <80 mmHg, this recommendation is not supported in the JNC8 guidelines due to limited evidence and lack of randomized control trials. Most evidence suggesting benefit with DBP reduction to <80 mmHg has been based on epidemiologic data and post hoc analysis of large studies such as the HOT trial. In older patients with hypertension, JNC8 has adjusted the BP goal to <150/90 mmHg. Previous recommendations of a goal BP of <140/90 mmHg were based on the post hoc analysis of large clinical trials such as Systolic Hypertension in the Elderly People(SHEP) in which a 20 mmHg reduction in BP from the baseline was associated with a 30% reduction in stroke. However, very few patients in this study achieved that goal. Recently published trials such as the Japanese trial to assess optimal SBP in elderly hypertensive patients (JATOS) and the study of Valsartan in Elderly Isolated Systolic Hypertension Study (VALISH) have demonstrated that a SBP reduction to <150 mmHg instead of <140mmHg results in a similar reduction in cardiovascular events and may be more desirable from the viewpoints of cost benefit and risks involved with excess BP reduction. Patients with left ventricular dysfunction due to ischemic heart disease in the past have been recommended a low BP goal of<120/80 mmHg but none of the newer guidelines support it. Similarly, the earlier recommendation of a BP goal of<125/75 mmHg in patients with proteinuria >1g/d is now obsolete. In summary, although epidemiological studies indicate that blood pressure of >120/80mmHg is associated with a greater risk of kidney and cardiovascular disease, there was limited evidence to support SBP less than 140mmHg in adult hypertensive patients, until the publication of the Systolic Blood Pressure Intervention Trial (SPRINT). In this prospective, randomized controlled trial, 9361 people (mean age 67.9 years) with a systolic blood pressure of 130 mmHg or higher and increased cardiovascular risk, but without diabetes, were randomized to a blood pressure target of less than 120 mmHg versus a standard target of less than 140 mmHg. The primary composite outcome was myocardial infarction, other acute coronary syndromes, stroke, heart failure, or death from cardiovascular causes. After one year of treatment, the mean systolic blood pressure was 121.4 mmHg in the lower blood pressure target group and 136.2 mmHg in the standard blood pressure target group. The trial was stopped early after 3.3 years because of the significantly lower rate of the primary composite outcome in the intensive treatment group (0.75, CI 0.64-0.89, P<.001). All-cause mortality was also significantly lower in the intensive treatment group (0.73, CI 0.60-0.90, P=003). However, the rate of adverse events of hypotension, syncope, acute kidney injury, and electrolyte disorders, but not injurious falls, was higher in the intensive treatment group. Moreover, the results of the Action to Control CardiOvascular Risk in Diabetics (ACCORD) trial, are not at variance with the SPRINT study, and are generally consistent. The main differences were that the ACCORD trial had less statistical power compared to SPRINT, and its primary outcome included a higher proportion of events that are less sensitive to blood pressure reduction. Other trials have demonstrated similar sized benefits of blood pressure reduction to lower than the traditional goals in people with, or without diabetes.. Hypertension is defined as a BP ≥140/90 mmHg on two or more blood pressure readings taken at each of two or more visits after initial screening and is classified in the JNC 7 into stages as listed in Figure 4. Patients with hypertension have increased risk of cardiovascular disease. This relationship is continuous, consistent and independent of other cardiovascular risk factors. The cardiovascular risk in individuals aged 40 to 70 years begins at a BP of 115/75 mmHg and doubles with each 20/10mmHg increment up to 185/115 mmHg. In individuals <50 years, elevations in DBP confer cardiovascular risk but in older individuals ≥50 years, the DBP usually falls and the elevation in SBP and widened pulse pressure assumes more importance in terms of cardiovascular risk. Clinical guidelines by several national and international groups have recommended BP goals in different patient populations and are listed in Figure 5. But, many of these guidelines will change, given the important observations from the SPRINT study. What are the risks of excessive BP lowering? Although lowering of the BP is associated with significant cardiovascular benefits, excessive lowering (<120/80 mmHg) may be a concern associated with an increased risk of cardiovascular events, This J shaped relationship is particularly evident in older individuals (SHEP trial) and in hypertensive patients with coronary artery disease, as was recently observed in the International Verapamil Tradolapril Study (INVEST). In this trial, aggressive lowering of the DBP <70mmHg in hypertensive patients with coronary heart disease was associated with an increase in all cause death and myocardial infarction (MI). The results of the SPRINT study do not suggest that reducing systolic blood pressure to 120 mmHg is unsafe, despite the fact these were more side effects in the more intensive blood pressure goal group. The diastolic blood pressure at one year was 76.3 mmHg in the standard group, and 68.7 mmHg in the intensive group. Whether there is a risk related to reducing diastolic blood pressure below these values is not known. What is the role of lifestyle modification in management of patients with hypertension? Although the primary focus of most hypertension trials is on the role of antihypertensive therapy in BP management, extensive evidence exists in the role of lifestyle modifications in controlling hypertension. Lifestyle modifications are known to prevent hypertension, reduce BP in hypertensive individuals, and enhance the efficacy of antihypertensive therapy. The best evidence exists for the following lifestyle changes and are shown in Figure 6.
a) Intravascular volume expansion with increased expression of renal sodium channels promoting salt retention. b) Smooth vessel proliferation leading to increased peripheral vascular resistance. A 2.4 g/d (100 mmol/d) decrease in sodium intake is associated with 6/2 mmHg decrease in BP, particularly in individuals >40 yrs of age. Low sodium intake (2.4g/d) is associated with reduction of stroke mortality by 8-15%, cardiovascular mortality by 25% and all cause mortality by 4-7% over 10-15 year period. The other benefits of low salt intake include reduction in the risk of kidney stones and osteoporosis, through diminished urinary calcium excretion. In addition, low sodium intake also reduces the need for potassium supplementation in patients on diuretic therapy, and increases the efficiency of RAAS inhibitors. Although table salt, meats, nuts and grains form the common source of salt in the US diet, most of the salt consumption comes in the form of processed and preserved foods. Appropriate food counseling is therefore a vital part of hypertension prevention and treatment. The average US consumption of potassium is 3000 mg/d, much lower than the recommended intake of 4700 mg/d. Potassium in food exists either as potassium bicarbonate or citrate and is particularly abundant in fruits and vegetables. A 25% increase in the potassium intake in food has been shown to reduce BP by 4/2.5 mmHg in individuals with or without hypertension. Other benefits of potassium rich diet include reduced risk of arrhythmias, improvement in endothelial function and arterial compliance. High potassium intake in the general population is also associated with reduced risk of stone formation and osteoporosis, through its effects on urine calcium excretion. In addition, animal studies have shown that high potassium intake offers cardiovascular and renal benefits, beyond BP reduction. Dietary Approaches to Stop Hypertension (DASH) diet is among the most widely studied dietary recommendations in the management of hypertension. This diet involves an eating plan that is low in cholesterol, total and saturated fat, as well as lean red meat, sweets, sugar containing beverages, added sugars. It emphasizes low fat or fat free milk and dairy products, and is rich in fruits and vegetables and a diet that contains high potassium, calcium, magnesium, protein and fiber (Figure 7). The initial DASH Study involved 459 adults, 60% of whom were AA and 28% had hypertension. They were provided a DASH diet in a highly controlled setting for 8 weeks with daily sodium intake of 3 grams. At the end of the study, SBP and DBP were reduced by 5.5 and 3 mmHg, in pre-hypertensive and by 11.4 and 5.5 mmHg, respectively, in hypertensive individuals. The effect was more pronounced in AA, women and individuals with metabolic syndrome. In the subsequent DASH study that examined the additive benefit of sodium restriction in patients on the DASH diet, reducing daily intake of sodium from 3000 mg/d to 2300 mg/d and 1200 mg/d resulted in a drop in blood pressure by 1.6/0.6 and 5.1/2.4 mmHg respectively, with the effect again being more pronounced in hypertensive individuals. Hence, a dietary plan that involves a DASH diet with sodium intake <2300 mg/d provides the best benefit in the prevention and treatment of hypertension. Alcohol intake shares a paradoxical relationship with cardiovascular mortality. Ingestion of 12 oz. of beer (1 average beer bottle), 5 oz of wine (1 glass of wine) 1.5 oz of 80-proof liquor such as whiskey constitutes 1 drink. While there is compelling evidence that moderate alcohol consumption (defined as 2 drinks/day for men <60 years of age and 1 drink/day for all women and older men) is associated with decreased cardiovascular risk, consumption of alcohol is also known to promote the development of hypertension and worsen preexisting hypertension. In the INTERSALT study, individuals who drank 2.8-4.8 drinks/day had an increase in BP of 2.7/1.6 mmHg. A meta-analysis of 15 randomized trials done to investigate the effect of alcohol reduction on BP noted that a 67% reduction in alcohol intake from 3-6 drinks/day resulted in a decrease in BP by 3.3/2.04 mmHg. It is therefore advisable for men with preexisting hypertension to limit alcohol consumption to ≤ 2 drinks/day and 1 drink/day for women and older men. Several clinical trials have demonstrated a linear relationship between weight loss and reduction in BP. In a large meta-analysis of 25 trials, a 1.1/0.9 mmHg drop in BP was noted per kg of weight lost but most of this drop in BP was noted in the short term with the effect dissipating with longer follow up. Although it is undeniable that weight loss is beneficial in reducing BP, the failure of the long term studies to show any impact on BP is likely due to the difficulty in consistently maintaining the lower weight. Most studies show only minor change in weight. It is therefore vital to incorporate the strategies to maintain appropriate body weight in order to maintain the effect on BP reduction. Bariatric surgery is an attractive alternative in patients who fail dietary measures. Regular physical activity reduces the risk of developing hypertension in normal healthy adults and reduces BP in individuals with hypertension. Aerobic exercise for at least 30-90 min/day most days of the week is effective in providing a modest reduction of BP by 4-9 mmHg. When should drug treatment be initiated in the management of patients with hypertension? a) In patients with low to moderate cardiovascular risk who continue to have BP of ≥ 140/90 despite attempting 3-6 months of lifestyle modifications. b) In patients with stage 1 hypertension or higher who have evidence of target organ damage (LVH, retinopathy or CKD). c) In patients with diabetes, CKD and those at high cardiovascular and cerebrovascular risk, antihypertensive therapy should be initiated at the time of diagnosis concomitantly with lifestyle modification. d) In patients with DBP ≥ 110 mmHg at the time of diagnosis. How should antihypertensive drugs be selected in management of hypertension in the general population? What combination of drugs is preferred and which ones should be avoided? The goal of antihypertensive drug therapy is reduction in the cardiovascular and renal events by lowering the systolic blood pressure to approximately 120 mmHg although this cannot be generalized to all patients.. More data on the optimal diastolic blood pressure goals are needed, but based on the SPRINT results, is probably around 70 mmHg. Antihypertensive drug therapy in conjunction with lifestyle modifications is often essential in achieving this goal. The initiation of antihypertensive therapy with a single agent is acceptable in most patients with stage 1 hypertension though it is important to understand that only 30-50% patients achieve the BP goal with monotherapy. Intensification of BP regimen needs to be individualized. Options include full titration of the first drug to maximal dose before adding a second drug, or adding a second drug in submaximal dose to the first drug at submaximal dose. A meta-analysis of randomized controlled trials (RCTs) have shown that the largest BP reduction in patients on single drug (HCTZ, ACEI, CCBs or β-blockers) occurs at half standard doses and any further BP reduction with dose escalation occurs at the cost of increased side effects, with the exception of ACEI. These findings have led to a paradigm shift from a step-wise approach in which the dose of the first drug would be maximized before other drug could be added, to the current recommended approach starting the second drug while the patient is on half standard dose of the first drug. In patients with stage 2 hypertension or whose BP is 20/10 mmHg above goal, starting dual therapy (2 drugs) is often recommended. In most patients with uncomplicated hypertension, cardiovascular risk reduction is related to the amount of BP reduction and not the initial choice of antihypertensive drug therapy. In patients with comorbidities, selection of the drug is guided by the safety of the drug with certain comorbidities and the benefit of additional cardiovascular risk reduction, beyond BP reduction. The most commonly used agents as initial therapy include the diuretics, calcium channel blockers (CCBs) and the RAAS blockers (ACEI/ARB). Younger patients (≤ 55 years) and non-AA ethnicity respond well to RAAS blockers whereas diuretics or CCBs tend to be more efficacious in the older patients and AA ethnicity. The use of β-blockers as first line agent is no longer preferred in the general population due to recent trials/evidence indicating reduced protection against stroke and all cause mortality. The advantages and disadvantages of different antihypertensive drugs are listed in Figure 8, and preferred drugs for compelling conditions are listed in Figure 9. Which combination antihypertensive therapies should be preferred and which ones should be avoided? More often than not, BP control requires multiple drug combinations, particularly in patients whose BP is >20/10 mmHg above goal, in those with concomitant conditions, and in patients whose BP remains uncontrolled with monotherapy (>50% patients). Using a higher dose of a single medication in some patients may be offset by the cost of increased risk of side effects. Combination therapies often display near additive effects on BP reduction. This may be related to the ability of one drug to block the counter regulatory responses of the other. The combination of a thiazide diuretic and RAAS blocker is perhaps the most commonly used drug combination. For example, the effect of thiazide diuretics to cause mild hypovolemia and induce RAAS activation can be modified by the ACEI/ARB. Selection of combination therapies should be based on their complementary action, additional cardiovascular reduction beyond BP control, safety profile, and presence of a specific indication in addition to BP control. Several potentially beneficial combinations are listed in Figure 10. The combination therapy of ACEI and ARB or an ARB and inhibitor that was earlier advocated for proteinuria reduction in the management of patients with CKD is not recommended due to lack of any clinical benefit and is potentially harmful. In the ALTITUDE TRIAL (Aliskiren Trial in Type 2 Diabetes Using Cardio-Renal Endpoints), dual therapy with Aliskiren and ACEI or ARB was associated with proteinuria reduction and BP reduction but the study was concluded early due to concerns of hyperkalemia and hypotension in the dual therapy group. In the recently published VA – NEPHRON – D trial, combined use of ACEI and ARB showed no significant benefit in proteinuria reduction in diabetic patients and the data monitoring safety committee stopped the trial before completion due to increased episodes of hyperkalemia and acute kidney injury in patients on dual therapy. It is safe to conclude that combination RAAS blockade therapy should be avoided in all patients. How is hypertension managed in these special populations? Obesity is a growing epidemic in the US, affecting one third of its population, which significantly increases the risk of hypertension. Obesity is associated with multiple other comorbidities such as diabetes, coronary heart disease, stroke and obstructive sleep apnea (OSA) that further increase the risk of cardiovascular disease. Obesity is particularly prevalent in AA and Hispanics and individuals of low socioeconomic status. Over two thirds of hypertensive individuals have been shown to be overweight or obese, suggesting a possible relationship between these two major public health issues. a) RAAS activation: Several animal and human studies have proved that RAAS is upregulated in obese individuals. This upregulation of RAAS cascade is directly linked to the selective production of angiotensinogen by the adipocytes which increase the circulating systemic levels leading to RAAS activation and hypertension. b) Increased SNS activity: Abundant evidence exists that SNS activity is exacerbated in obese individuals but the mechanisms are largely unclear. Best proposed hypothesis suggests a possible role of leptin secreted by adipocytes to directly increase SNS activity though the mechanism by which this occurs remains unexplained. Other molecules such as adiponectin, resistin and insulin have also been identified as other possible molecules involved in SNS activation. According to the recent studies, obstructive sleep apnea (OSA) is an extremely common comorbidity affecting 85% of obese individuals. Intermittent hypoxia is a common manifestation in these patients and has been implicated in enhancing SNS activity which promotes the development of hypertension. Besides, there is evidence of impairment of endothelium mediated vasodilation of peripheral vessels, thereby contributing to an increase in peripheral resistance. Endothelin-1 levels have been found to be increased in OSA patients and correlate with the severity of hypertension. How does the treatment of hypertension differ in obese individuals as compared to the general hypertensive population? The treatment of hypertension in obese patients should specifically target the pathophysiologic mechanisms that play a role in raising BP. Weight reduction achieved with DASH diet and physical exercise is perhaps the cornerstone in the treatment of hypertension in obese patients. It is vital that patients be educated that even slight reduction in weight is beneficial in reducing BP, though it is extremely important that weight loss be sustained to see this benefit. Pathophysiologically, weight loss leads to reduction in RAAS activity, SNS activity which leads to decrease in cardiac output, peripheral resistance and left ventricular mass, all of which promote improvement in BP and improve cardiovascular health. Additionally, leptin, endothelin-1 and insulin resistance is lowered with weight loss. Other non-pharmacological measures like a low sodium, high potassium diet are equally important. as obesity is a sodium avid state. Recent animal studies also indicate that a subset of obese patients may have salt sensitive hypertension, giving us another good reason to recommend low sodium diet in this population. Antihypertensive drugs that block RAAS cascade (ACEI and ARB), a major pathogenic mechanism involved in obesity related hypertension, are the most preferred antihypertensive drugs in obese patients. The metabolic effects of RAAS blockade include reduction in proteinuria and lower norepinephrine, leptin and insulin levels with heightened insulin sensitivity, all of whom lead to lowering of BP in this population. Although limited, the best clinical evidence comes from TROPHY study in which treatment of hypertension in obese patients with lisinopril not only led to improvement in BP but no metabolic side effects were noted as compared to the other arm in which treatment with thiazide diuretics was associated with increased incidence of hyperglycemia. Similar findings were noted in other study that used amlodipine versus aliskiren or irbesartan in patients already on thiazide diuretics. Patients on amlodipine reported high rate of peripheral edema. Though clinical trials specifically using aldosterone blockade are lacking in obese patients, a growing body of evidence indicates that aldosterone activation is associated with insulin insensitivity, glucose intolerance in addition to its hypertensive action, thereby suggesting a beneficial role of aldosterone blockade in the management of hypertension in obese patients. Therefore RAAS inhibitors such as ACE inhibitors, ARB, direct renin inhibitors and possibly aldosterone blockers should be used as first line drugs in the management of hypertension in obese patients. Thazide diuretics are useful for BP control due to their natriuretic effect, as was noted in the TROPHY study but their unsafe metabolic profile with increased insulin resistance, predisposition to hyperglycemia and risk of visceral obesity precludes its use as a first line agent in obese patients. It still can be used as an adjunctive therapy in patients already on RAAS blockers. Calcium channel blockers are a preferred adjunctive therapy in management of hypertension because of their ability to reduce peripheral resistance, induce mild natriuresis and diuresis, and offer a safe metabolic profile. Moreover, they lower blood pressure effectively regardless of age, gender, ethnicity, and salt consumption. Although drugs that cause SNS blockade are effective in obese patients, they are generally less preferred due to side effects. Alpha-1 blockers may induce orthostasis and are associated with increased risk of heart failure, as seen in the Antihypertensive and Lipid-Lowering Treatment to Prevent Heart Attack Trial (ALLHAT). Alpha-2 blockers may be poorly tolerated by patients due to increase side effects such as dry mouth and sedation. Selective β-blockers, although effective in BP control, have been associated with worsening of insulin resistance, weight gain and dyslipidemia. However, newer vasodilating β-blockers such as carvedilol and nebivolol do not share the negative metabolic profile as the selective and non-selective β-blockers and therefore should be considered preferred treatments, especially if β blockade is indicated due to existing comorbidity, such as congestive heart failure, angina or prior myocardial infarction. Hypertension is present in ~70% of adults in US who are ≥ 60 years and 90% in individuals ≥ 70 years, with the highest prevalence in older women, AA and in those with diabetes and CKD. In the older individuals, hypertension increases the risk for cardiovascular events (stroke and CHF), incident diabetes, atrial fibrillation and CKD. Isolated systolic hypertension (defined as SBP >140 mmHg) accounts for 80% of hypertension encountered in this group. Contrary to the older belief that hypertension in older patients is an adaptive response to aging to support organ perfusion, clinical trial evidence, particularly the Framingham Heart study, SHEP, and other epidemiologic studies have conclusively indicates that elevation in SBP in older individuals is associated with adverse cardiovascular events, particularly stroke and CHF, and progression to ESRD. Aging causes stiffness in the large blood vessels due to increased collagen deposition and a decrease in elastin. These alterations decrease arterial compliance and elasticity thereby resulting in increased SBP, decreased DBP and widened pulse pressure. In addition, older people have increased salt sensitivity due to altered handling in sodium by the kidney and reduction on sodium potassium: ATPase activity with age that promotes an increase in peripheral resistance. What are the important differences in BP management in older patients? Hypertension in older patients is associated with much more increased risk of stroke and CHF as compared to younger individuals. Older patients are at increased risk of symptomatic hypotension due to high prevalence of autonomic dysfunction. It is therefore advisable to check BP in both the sitting and standing position in older patients with progressive reduction of BP. <120 mmHg is generally acceptable in older patients. Attempts to lower SBP ≤ 15 mmHg should be cautiously considered if the DBP is less than 55mmHg due to the J curve phenomena of increased cardiovascular events, as was noted in the SHEP trial. In older patients with concomitant ischemic heart disease, DBP should probably not be lowered below 60 mmHg. Careful individualization of blood pressure targets is needed in all, but especially older patients. The magnitude of SBP elevation in older patients is much greater than younger after individuals necessitating 2 or 3 medications, preferably with long acting diuretics, or CCBs, and RAAS inhibitors. The use of RAAS blocking agents may provide additional benefit of cardiovascular risk. Older patients are at increased risk of falls and medication side effects, particularly electrolyte abnormalities and worsening kidney function. Close monitoring every few months is therefore recommended. Hypertension affects one third of adult US population, but minorities such as AA, non-white Hispanics and South Asians are disproportionately more affected. Among minorities, AA have the highest prevalence of hypertension (40%), followed by non-Hispanic whites (27.4%) and Mexican Americans (27.1%). It is estimated that ≥ 40% of adult AA carry the diagnosis of hypertension. AA patients are generally younger, have stage 2 hypertension, and are more likely to have associated target end organ damage such as LVH, diastolic dysfunction and CKD compared to non-AA. Although >70% of AA are aware of the presence of hypertension, and two thirds receive treatment, only 1 in 3 patients have their BP under control. On the contrary, Mexican-Americans have the lowest awareness of their condition, and are therefore less likely to receive treatment and have BP under control. This is likely due to their low socioeconomic status and lack of access to healthcare. Several factors account for the high prevalence of hypertension in minority groups. 1. Although somewhat speculative, genetic tendencies may likely predispose to hypertension in AA. There is evidence that Myosin Heavy Chain 9(MYH9) and Apolipoprotein L1 (APOL1) gene mutations are associated with increased the risk of disease and hypertension in AA. Additionally, genetic alterations involving sodium handling by the kidneys, RAAS polymorphisms, endothelial stiffness, and altered NO synthesis and metabolism have all been suggested as putative factors in increasing hypertension prevalence in this population. 2. Prevalence preterm birth and small for gestational age are more common in minority populations. These conditions may predispose to future risk of CKD and hypertension. In addition, pre-eclampsia is common in AA and predisposes to the future risk of hypertension in the offspring. 3. Obesity is more prevalent in minorities, particularly in AA, and non-white Hispanics. This coupled with low rates of physical activity, significantly increases the risk of hypertension. 4. Poor dietary habits such as high salt intake, high calorie foods also increase hypertension risk. 5. Coexisting medical conditions such as diabetes and CKD and contribute to the burden of high hypertension in this population. 6. Lastly, low socioeconomic status and literacy along with lack of access to quality health care and physician perception towards difficulty in BP control in minorities may form important impediments in better identification and treatment of hypertension. The evidence-based goal of systolic blood pressure in all patients irrespective of ethnicity and socioeconomic status is. However, all BP goals need to be carefully individualized. The management of hypertension requires therapeutic lifestyle changes to play an important central role in blood pressure reduction. According to JNC8 and the International Society of Hypertension in Blacks (ISHIB) guidelines, diuretics or CCBs are preferred as first line agents in the management of hypertension in AA. These recommendations are well supported by the ALLHAT trial that compared chlorthalidone with lisinopril and amlodipine as a first line treatment of hypertension. Chlorthalidone use was associated with a reduction in BP and led to better reduction in stroke, heart failure, and combined CV outcomes in the AA population. Lisinopril use led to less reduction in the incidence of stroke and combined CV outcomes. This was largely explainable by less reduction in BP. Diuretics also increase the effectiveness of ACEI and β blockers when used in combination, and are easily available and better tolerated. CCBs are reasonable alternatives to diuretics despite being less effective in improving heart failure, as was noted in the ALLHAT study. They provide almost similar blood pressure reduction. CCBs may provide more cardiovascular event risk reduction compared to a thiazide when used with an ACEI in both AA and non-AA and is usually the combination therapy of choice. A combination therapy is indicated in AA patients whose BP is >15-20/10 mmHg above goal. ACEI are less effective agents when compared to diuretics or CCBs when used as monotherapy in AA but this effect is attenuated when combination therapy with thiazide diuretics or CCBs are used. Besides, the incidence of ACEI-induced angioedema is two times higher in AA as compared to others. It is important to note that the angioedema can occur after being on the ACEI for a long time and recent reports have suggested recurrent abdominal pain in patients due to gut angioedema. In AA hypertensive patients with CKD associated with microalbuminuria or protein uria, the observations from the African American Study of Kidney Disease and Hypertension (AASK) suggest avoidance of that dihydropyridine CCB as monotherapy for BP management. RAAS blockers use is preferable in these patients due to the reduced risk of progression to ESRD and CV events. Limited data exists of any specific benefit of using one class of antihypertensive drugs over another in Hispanics and Asians. It is therefore reasonable to follow general guidelines for BP management in these populations. Despite normalization of renal function and improvement in volume control following kidney transplantation, the prevalence of hypertension is reported to be 60-80%, and is ≥ 95% if a cut off BP of 130/80 mmHg is considered the goal. Post-transplant hypertension is associated with increased CV mortality, acute rejection and chronic allograft loss. Multiple factors contribute to the development of hypertension in kidney transplant recipients (KTRs). These include preexisting recipient factors, donor specific factors, use of immunosuppressive agents, and chronic allograft dysfunction (Figure 11). The use of calcineurin inhibitors (CNIs) is perhaps the most important cause in the pathogenesis of hypertension. CNIs cause hypertension due to salt retention with resultant volume expansion. In addition, CNIs also activate SNS activity, intra-renal renin synthesis, and constriction of preglomerular vasculature, all of which promote development of hypertension. Tacrolimus (TAC) is associated with less risk of hypertension compared to cyclosporine. Chronic steroid use >10mg/day may contribute to the development of post-transplant hypertension. This is likely a dose-related side effect. Transplant renal artery stenosis (tRAS) is another important etiologic factor in the development of hypertension following kidney transplantation. The incidence of tRAS has been reported to range from 1 to 23%, with most of this variance attributed to differences in definition and diagnostic technique employed. Most episodes of early (≤ 3months following transplant) tRAS are due to surgical complications, such as donor vessel trauma, kidney malpositioning, or stenosis at the surgical anastomosis. Late tRAS is rarely related to surgical complications. Several risk factors have been implicated in the development of late tRAS, including graft rejection, CMV infection, prolonged cold ischemia time, delayed graft function, and pediatric donor source. What should be the BP goal in KTRs and how does their management differ from the general population? Current KDIGO 2012 guidelines recommend a BP target of <130/80 mmHg in KTRs. This recommendation is largely derived from extrapolation of results from epidemiologic data and is not strictly evidence based. No RCT have been conducted to determine the impact of BP lowering to <130/80 mmHg on allograft survival. In view of recent evidence supporting a more conservative BP goal of <140/90 mmHg in the non-proteinuric CKD population, it would be reasonable to individualize BP goal decisions based on the benefits of intensive BP control by adding more medications against the potential drug-drug interactions in these complex patients taking immunosuppressive medications. CCBs are often recommended as first line agents in the management of post-transplant HTN due to their ability to attenuate the effect of CNI-induced preglomerular vasoconstriction. Studies have also shown improvement in GFR in KTR and reduced risk of graft loss in patients on CCBs. Early studies in KTRs discouraged the use of RAAS inhibitors due to the concerns of hyperkalemia, anemia and risk of acute kidney injury. However, recent studies have demonstrated an increasing acceptance of the use of RAAS blockers because of their cardiovascular benefits and antiproteinuric effects. Their role in the preservation of long term allograft function is unclear. In contrast to the general hypertensive population, β-blockers are acceptable alternative agents in BP management in KTRs due to their cardiovascular benefits, which is especially important in this population. Often KTRs will need some diuretic support for BP control, especially if there is evidence of graft dysfunction. Hypertension is a major independent risk factor for coronary artery disease in adults. Both elevations in SBP and DBP predict increased risk of ischemic heart disease. While DBP ≥90 mmHg is important risk factor in young adults, SBP assumes more importance in older individuals (over age 55 years) with the incidence of isolated systolic hypertension accounting for >80% and diastolic hypertension accounting for <10% of all causes of hypertension. Statistically, each increase in SBP>20 mmHg beyond a systolic BP of 115 mmHg is associated with doubling of CAD risk. The risk of CAD can be greatly reduced by lowering BP. Clinical studies have shown that a SBP reduction of 10 mmHg is associated with 40-50% lower risk of CAD events. The target goals for BP in patients for primary and secondary prevention of coronary artery disease are listed in Figure 5. How do the recommendations for patients with CAD differ from general population, and why? Certain differences exist in the treatment of hypertension in patients with ischemic heart disease. 1) The relationship between the DBP and coronary events demonstrate a J-shaped curve with increased cardiovascular events above 90 mmHg and below 70 mmHg in patients with ischemic heart disease. This phenomenon is likely due to impaired coronary perfusion during diastole beyond the autoregulatory threshold of the endothelium due to decreased DBP in patients with CAD. It is therefore recommended that DBP not be lowered ≤ 70 mmHg in patients with IHD, particularly in older individuals who are at the highest risk. It should however be stated that this phenomena has not been consistently demonstrated in clinical studies and merits further review. Moreover, the influence of heart rate has never been evaluated. It is likely that as heart increases above 80 that the ischemic risk of low DBP increases. 2) AHA/ACC guidelines recommended a BP target of ≤ 130/80 for primary and secondary prevention of coronary artery disease. However, they will likely change with the SPRINT results. Prior to the SPRING study, the best evidence for BP goals in patients with CAD comes from the Comparison of Amlodipine vs Enalapril to Limit Occurrences of Thrombosis (CAMELOT) study that looked into the benefits of antihypertensive therapy in CAD patients with “normal BP” as defined by the JNC 7. The mean treatment BP in this study was 129/77 mmHg. Lowering of the BP below 140 mmHg with amlodipine or enalapril was associated with decreased cardiovascular events. In a sub study, atheroma reduction was noted with lowering of BP below 140/90 mmHg. These findings support the notion that a target BP of 130/80 mmHg is preferable.) In patients with ischemic left ventricular dysfunction (EF ≤ 40%), a target BP of ≤ 120/80 mmHg iwill likely be recommended, largely based on evidence to come from the SPRINT study. What are the important differences in the management of hypertension in patients with CAD, acute coronary syndromes and patients with ischemic LV dysfunction? There is general agreement that the amount of BP reduction rather than the choice of antihypertensive drug is a major determinant of reduction in cardiovascular risk. β-blockers are considered first line agents in the management of hypertension inpatients with history of CAD. ACEI/ARB can be added if diabetes mellitus or left ventricular dysfunction coexists. Thiazide diuretics are acceptable alternatives though there are concerns about their long-term metabolic effects. If combination therapy is needed, these three agents still remain first line agents even in the absence of diabetes and left ventricular dysfunction. Calcium channel blockers are preferred drugs in patients in whom β-blockers are contraindicated such as patients with severe obstructive airway diseases and peripheral vascular disease. The presence of systolic dysfunction however, precludes their use in management of these patients. These drugs can be used in patients already on β-blockers if they have angina or BP is not at goal. In patients with unstable angina and acute myocardial infarction, β1 selective β-blockers remain the mainstay of treatment in the management of hypertension. Intravenous β-blocker therapy followed by oral therapy or immediate initiation of oral β-blocker therapy is recommended unless contraindicated. Thiazide diuretics can be used for additional BP control. Calcium channel blockers are reasonable alternatives in patients in whom β-blockers are contraindicated but their benefits in patients with ST elevation acute myocardial infarction (MI) are lacking. ACEI should be used along with β-blockers if patients have anterior MI, concomitant diabetes mellitus, or evidence of LV dysfunction. Aldosterone antagonists have a proven value in the management of hypertension in patients with LV dysfunction following STEMI and LV dysfunction. In patients with ischemic LV dysfunction (LVEF<40%) thiazide diuretics are generally effective in the management of hypertension, particularly in patients in whom better BP control is needed. Loop diuretics may be preferable in volume overloaded patients or when renal dysfunction is present. Several large clinical trials have demonstrated the benefit of ACEI or ARB therapy in management of patients with ischemic LV dysfunction. These drugs reduce risk of cardiovascular death and benefits may be seen beyond BP reduction. The combination therapy of ACEI and ARB has not been shown to provide any additional benefit and could be potentially harmful due to increased risk of hyperkalemia and worsening GFR. β-blockers are strongly recommended in the management of patients with LV dysfunction. Selective β-blockers and vasodilating β-blockers such as metoprolol and carvedilol are the most extensively studied. Non-dihydropyridine CCBs, α-blockers, and clonidine should be avoided in patients with reduced ejection faction due to increased risk of decompensated heart failure. Amlodipine and other dihydrpyridine CCBs appear safe but do not offer any cardiovascular benefit beyond BP reduction. Aldosterone antagonists such as spironolactone and eplerenone are a useful addition in patients already on ACEI, β-blockers and diuretics in patients with NYHA class III and IV heart failure with LVEF <40%. “A Randomized Trial of Intensive versus Standard Blood-Pressure Control”. N Engl J Med. vol. 373. 2015. pp. 2103-2116.